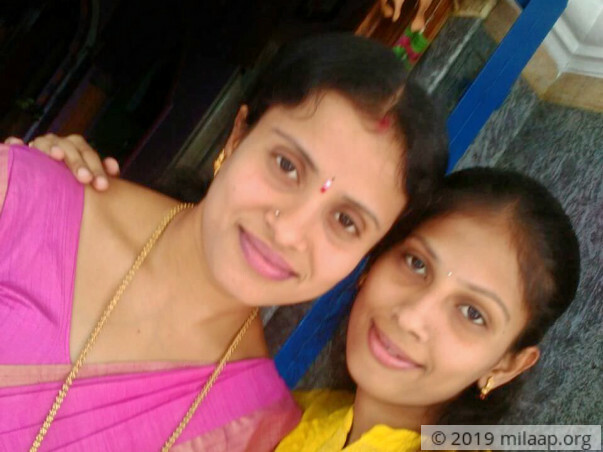 Sudharani is the youngest in our family. She has always been the baby - pampered by everyone - my parents and me, her elder sister. She is very special to me, I'm almost like her second mother. Cheerful and kind, she is the reason for our happiness. When she became an engineer, we were all thrilled at how much our little angel managed to achieve. She was waiting to pursue her master's degree. Despite our struggle to make the ends meet, we were determined to make at least her dreams come true. But Sudha used to have frequent stomach pain and nausea. We took her to hospitals, where they gave her medicines. We never took it seriously until she collapsed on the floor with pain. The reports confirmed that she has Crohn's disease. It is a disease in the digestive tract leading to excessive loss of weight, abdominal pain and diarrhoea. You can't imagine how debilitating and painful a disease it is till you see a loved one go through it. Sudha is 21-years-old but she weighs only 27 kg now. The cheerful Sudha, full of life, has become a distant memory. She is afraid to look in the mirror. Just a week after her graduation, an urgent surgery was done to remove a hole in her intestine. This surgery has left her with the deficiency of calcium. She can't absorb this from food and needs injections. Sudha was in ICU for few days and for the past 6 months, we have been running back and forth to the hospital. This disease has changed her life. She has chronic fatigue and it makes every single day painful. She needs an urgent surgery to patch up her intestine. My father is a farmer. All we had was one acre of land and we sold it for her treatment. None of us gave a second thought - that's how much we love her. I'm married and my other two sisters are not yet married. My family was dependent on that land but we sold it to save her life. My other two sisters are studying. My parents at their advance age are working day and night to save every penny for her treatment. We have lost count of the money we borrowed and spent. Yet, we are running short of funds for her life-saving surgery. Sudha doesn't know that we have sold our land, it will break her heart. She knows exactly how much it will hurt us to not have our small land that gave us our food. Even now, she asks us not to take so much pain for her. I have never seen her this weak and heartbroken. Sudha has gone through so much pain and she is still fighting it. A surgery can bring her lost happiness and health back. She can live her life and continue to spread happiness like she always does. We need her. She is the strength of our family. We can't afford to lose her. Sudha is too young to fear death. She has a lot of dreams. 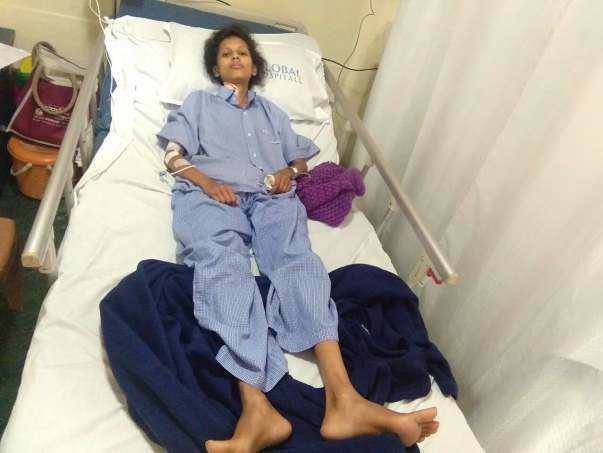 Doctors are hopeful that she will regain her weight and recover completely post the surgery. Sudha is waiting to get back to home, she is hopeful of living her life again. We have no money left with us. 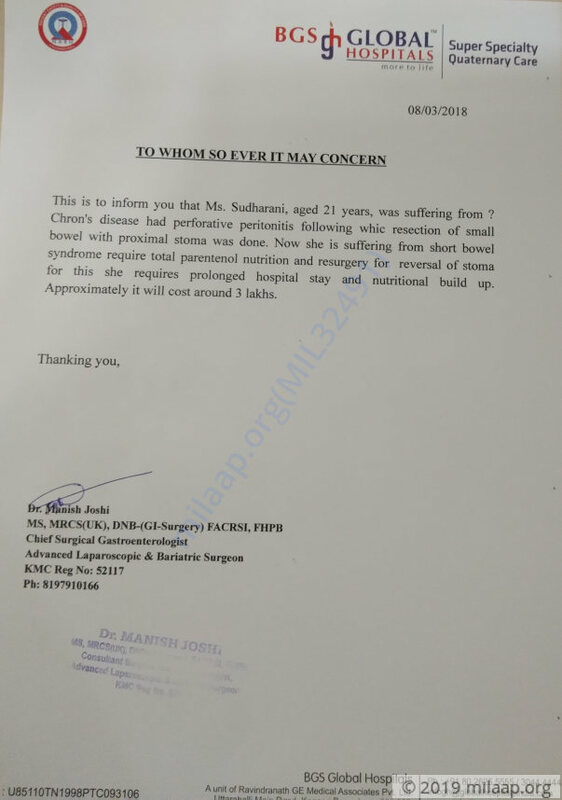 We are already running out of time and we need 3 lakhs for her surgery. What can we do for such a big amount? Only your contributions can save her life. Sudharani underwent a surgery few months back but she acquired Crohn's disease for which the treatment is going on. 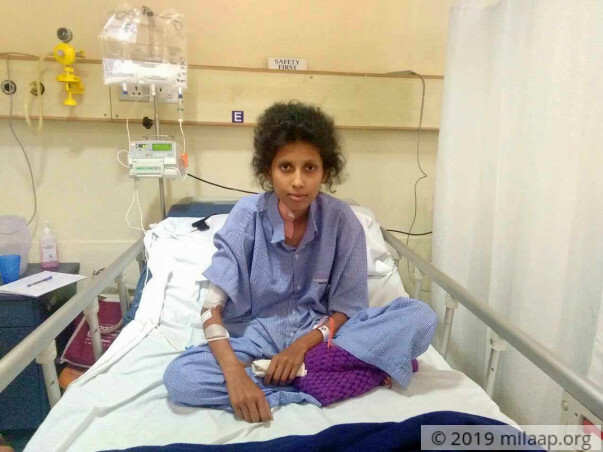 She needs to visit hospital for the treatment every month and the treatment will go on for life. We're really thankful for the love and support which you have shown towards Sudharani up till now, we shall keep you all posted.